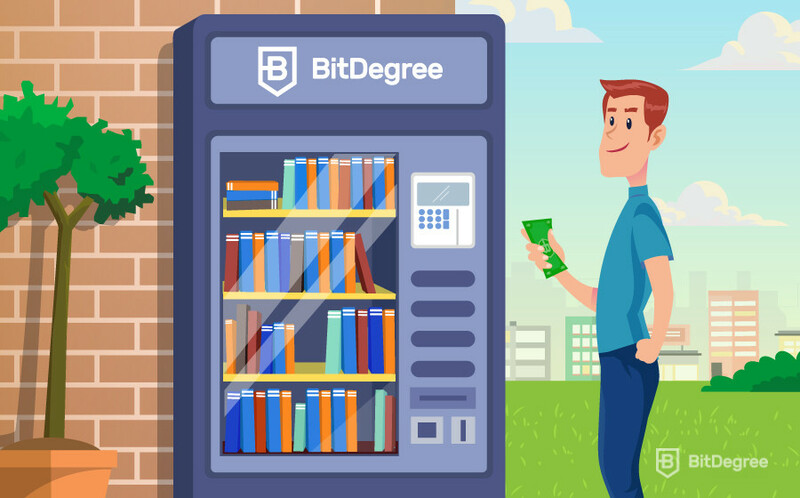 BitDegree tokens are needed to purchase online courses on the BitDegree platform. If you’re looking to learn some programming languages, web design, business or other digital skills, you might be in need of some BDG tokens. However, you’re wondering about how to buy BitDegree tokens? Well, this guide will teach you how to buy BitDegree tokens using ETH. 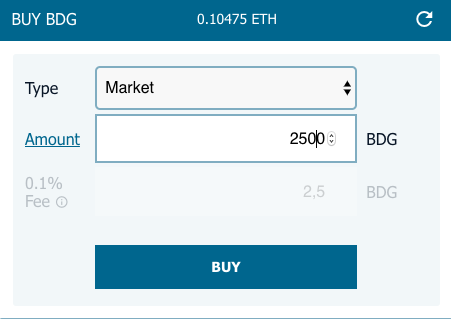 Follow the steps below to find out how to buy BDG tokens on various exchanges using ETH. Don’t have any Ether to buy BitDegree Tokens with? Learn How to Buy Ethereum With Credit Card and Bank Transfers. 1 Where Can You Buy BitDegree Tokens (BDG) with Ether (ETH)? Where Can You Buy BitDegree Tokens (BDG) with Ether (ETH)? 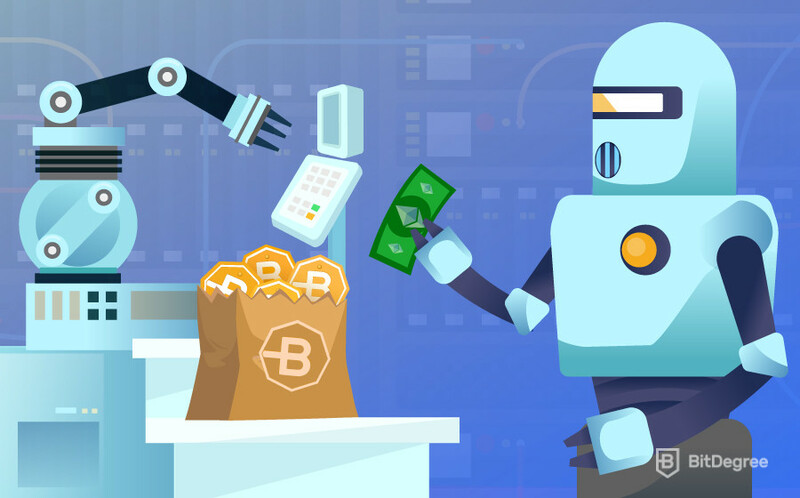 It is important to remember that only a couple of cryptocurrency exchange platform offer the option to buy BDG tokens. A large portion of exchanges allow you to deposit ETH, but you won’t be able to buy BDG tokens so selecting the right exchange is extremely important. And learning how to buy BitDegree tokens isn’t hard at all, it’s all about choosing the right exchange platform for you. Already have some BitDegree Tokens? Learn How to Buy a BitDegree Course! To help you get your footing in the cryptocurrency markets, I’ll explain below some of the best exchanges to buy BitDegree tokens with Ether! Let’s start with COBINHOOD! COBINHOOD has no trading fees. Meaning you can trade inside the platform as much as you want and you’ll only be charged a fee once you try to withdraw your currency into your digital wallet or another exchange platform. However, this withdrawal fee is pretty high. The withdrawal fee for BDG tokens during the time of writing is 150 BDG tokens which are equal to around 2$. It’s recommended to buy a largest amount and performing the withdrawal only once. As multiple withdrawals will increase the amount of BDG tokens, you leave as a tax significantly. COBINHOOD is an excellent choice for people who like to trade on the platform often and withdraw their funds in large bulks. As an additional incentive to trade on the COBINHOOD platform, they are offering Daily Bonus Draws. Once you make a successful transaction, you are eligible to spin a wheel where there’s a chance to win various prizes. The prizes are random at any given time, but at the time of writing, there’s a possibility to win up to 1 BTC. Using this method, you’re eligible for 1 spin per day. 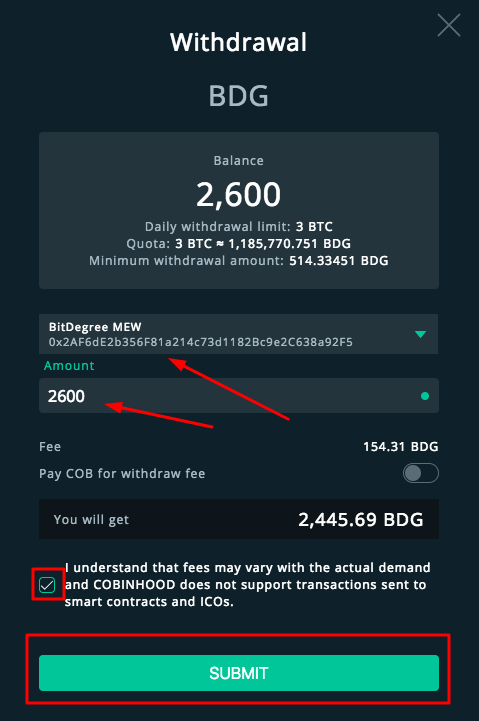 If you’re wondering how to buy BitDegree tokens using COBINHOOD, there’s a step-by-step guide provided below. However, a major drawback for some users might be the lack of a native COBINHOOD digital wallet. What they recommend is using Mist, MyEtherWalet or Metamask as a way to deposit/withdraw funds instead. COBINHOOD also advises against using your exchange wallet addresses (Binance, OKEx, Bitfinex and others) to make withdrawals or deposits. As of the time of writing, you’re not able to buy BDG tokens if you’re from Japan or the state of New York. HitBTC offers a unique feature that allows users to test the service before using it. A built-in demo platform can be used to test out trading before jumping into large volume trades. This is an invaluable tool for new traders who need to learn how to use the platform before trading. HitBTC also offers multi-language support so more often than not it’s possible to trade in your native language. HitBTC is one of the biggest exchange platforms. And most people buy BDG tokens on the HitBTC exchange platform as of the time of writing this article. Your orders might get filled faster, and you have more control over the price you want to buy your tokens for. 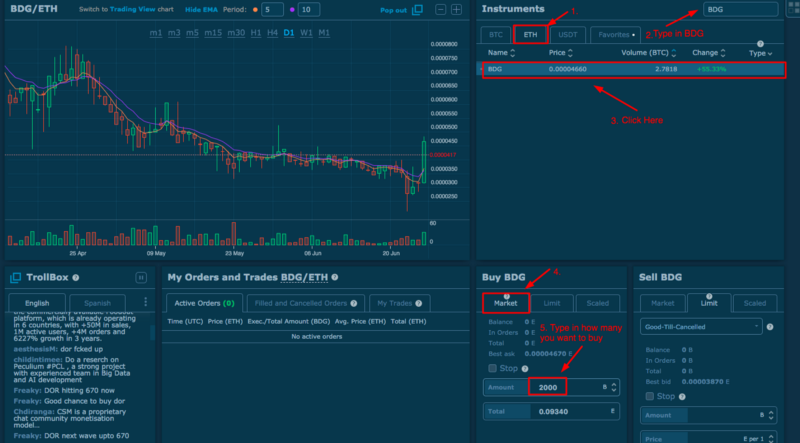 If you’re looking to learn how to buy BitDegree tokens using HitBTC exchange platform, there’s a step-by-step guide provided below. However, the fees are quite high. Excellent for people who want to trade quickly and easily without caring much about the fees. Furthermore, HitBTC is a good alternative for casual traders. If you do not need to move your cryptocurrency in and out of your wallet and exchange frequently. HitBTC is also supporting more than 50 different cryptocurrencies so trading between different cryptocurrencies isn’t an issue. IDEX is one of the top decentralized exchanges particularly in terms of the number of people that use IDEX and the trading volume. IDEX uses smart-contracts to perform all the trades and only functions as a way to connect 2 people who want to trade. And, IDEX is exclusive to the Ethereum network and only allows trading of ERC-20 tokens. IDEX is an extremely safe choice as it’s built to maximize security. All private keys are encrypted and can only be accessed inside the IDEX application. Furthermore, IDEX “forgets” your private key once you sign out so there’s even lower chance of someone gaining access to your private funds by stealing the private keys. If you’re here to learn how to buy BitDegree tokens using IDEX you can find a step-by-step guide below. Keep in mind that, IDEX doesn’t allow any other payments methods besides Ethereum. Meaning if you’re looking to buy BDG using Bitcoin, PayPal or your credit card you won’t be able to trade on IDEX. Step 1: Visit the COBINHOOD website by clicking this link. And click on “ Create Account “. Step 2: Fill out your account details. Use a strong password. Step 3: Go to the email address you’ve provided and activate your account. Step 7: Go to your digital wallet and send the ETH to the address you’ve just copied. Step 8: visit the COBINHOOD History Tab and wait for your transaction to complete. It should be 25/25 blocks before you see the ETH in your account. This might take 10+ minutes! Step 9: Once the transaction has completed. 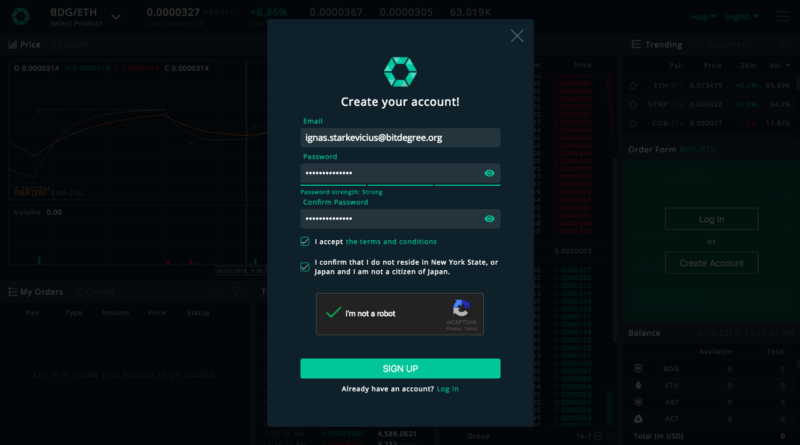 Go to the COBINHOOD website and choose the “Market” option. Input the amount of BDG you want, and click BUY. Step 10: The BDG tokens are now in your CobinHood Account. Click on “Funds” in the top menu again. Click on “Withdraw” next to BitDegree. Type in your real phone number. You’ll get an SMS message with a code, type in the code to enable 2FA. Once this is done, you’ll get an email that will ask you to confirm the 2FA. Click on the activate button. Step 12: Once you have 2FA activated go ahead and set up a withdraw address. You’ll only need to do this once per wallet. Select the currency as “BDG”. Type in anything you want as the Address Name. Type in your cryptocurrency wallet address in the “Address” line. Click Add. When you click “Add” you’ll need to check your phone. And SMS will come with a code, type in the code in the window that comes up. You’ll also get an e-mail asking for you to confirm the withdraw address. Step 13: Go to the menu and click on “Funds” then click “Withdraw” the button should be green now. Step 14: Input the amount you want to withdraw and choose the wallet you’ve added previously. You’ll need to input a code from your phone again and confirm through e-mail. 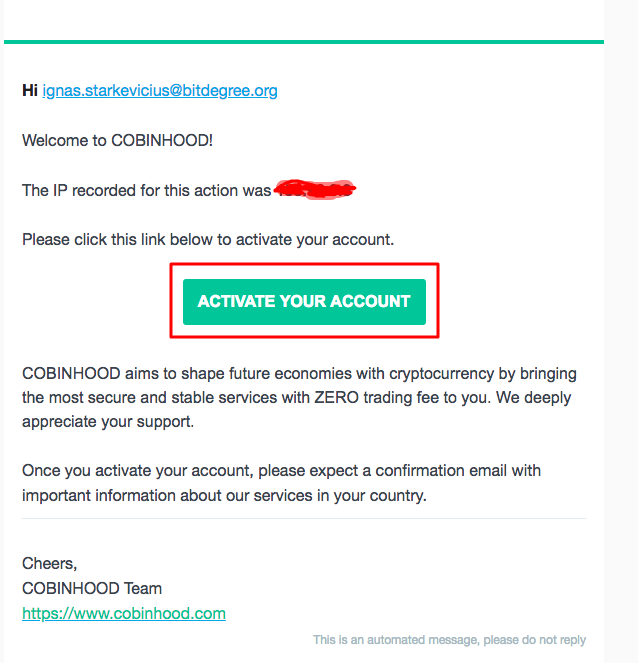 Step 15: You’ll need to wait for CobinHood to confirm your transaction. You can check the transaction information when you go to the Menu, then Funds and History. 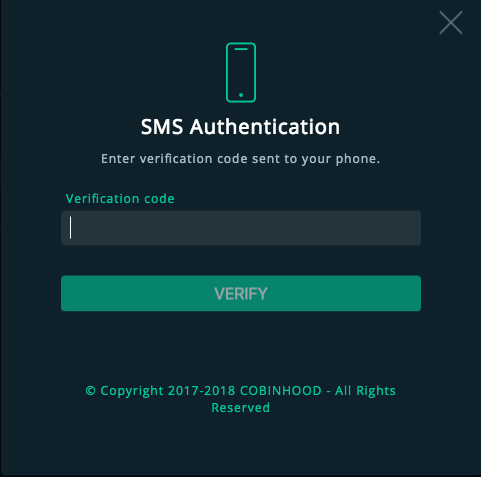 As soon as you see “Sent” in CobinHood your tokens should be in MyEtherWallet. So, now that you know how to buy BitDegree tokens with Ether on Cobinhood, the next part of this step-by-step guide is going to look at HitBTC. Step 1: Register a HitBTC account by clicking this link. Step 3: Transfer the ETH from your main account to your trading account. 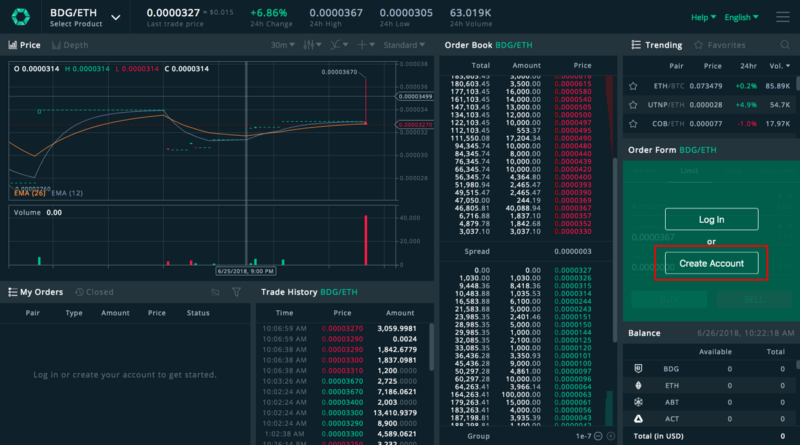 Step 4: Buy BDG on the exchange platform. Click on Exchange. Choose ETH. Type in BDG in the search. Click on Market. Choose the amount you want to buy. Click Buy Market. 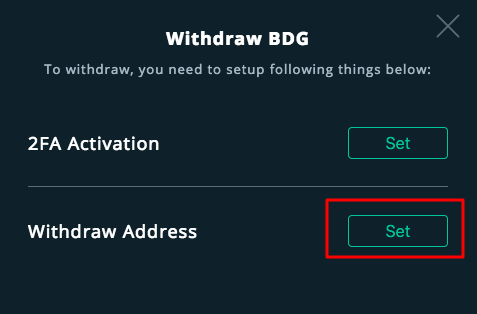 Step 5: Withdraw the BDG token to MyEtherWallet or other wallets by following this guide. It might take some time for the tokens to reach your wallet. 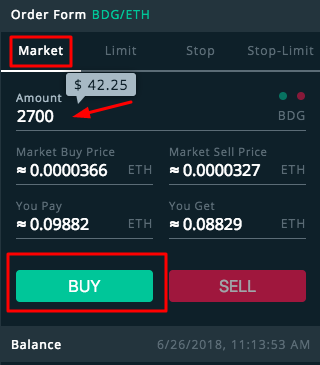 Now that you know how to buy BitDegree tokens with Ether on HitBTC, the final part of my step-by-step guide is going to show you how to buy BDG tokens using IDEX! Step 1: Visit the IDEX website by clicking this link. Step 2: Click New Wallet to create your wallet. Create your wallet using this guide. 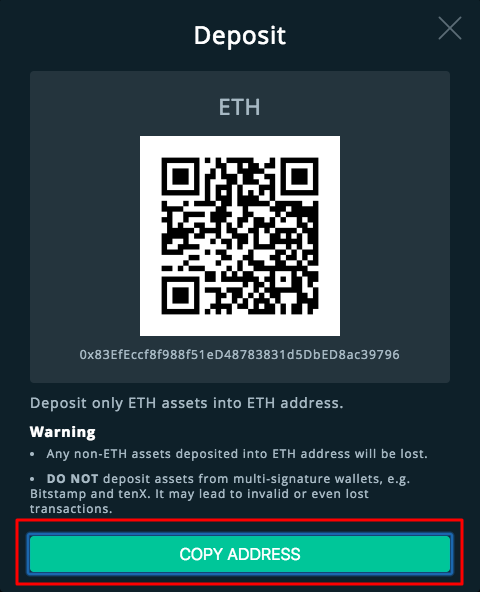 Step 2: Deposit ETH into your IDEX wallet by using this guide. Step 3: Transfer the ETH from your wallet to the IDEX wallet. To find ETH, type Ether into the search bar and look for ETH — ETHER. Click Deposit. Step 4: Click on Balances > Balance History. You will see a pending transaction. Once the transaction is complete you’ll get a popup like this. Step 5: Once the transaction is complete. Click Exchanges and type “BDG” into the search. Step 6: Scroll down and in the type select “Market”. Type in the amount of BDG you want to buy and click “Buy”. 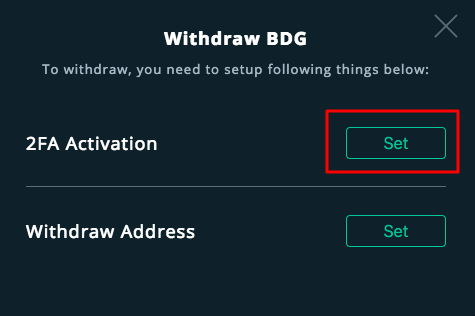 Step 7: Withdraw and Transfer your BitDegree tokens by following this guide. This might take some time, took around 6 minutes as of writing this. And that’s the end of the ‘How to buy BitDegree tokens with Ether’ guide! Now you can use your tokens to buy BitDegree courses, Learn How to Buy a BitDegree Course! Purchasing BitDegree Tokens isn’t hard and only seems intimidating for the very first time. There are several options to choose from each with their own pros and cons. All of the options will lead you to the same result. 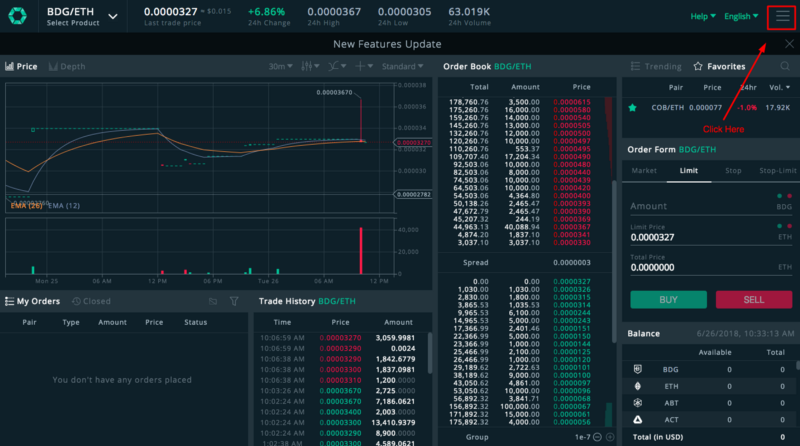 However, if you are simply looking for a quick way to buy BDG tokens, then I would suggest HitBTC, with the high trading volume you’ll get the best price, the fastest. So, which exchange are you going to use to buy BDG tokens? Let me know in the comments below!